UPDATE - As time goes by and I see how a plant performs in the garden from year to year, my views may change and I'll update old posts accordingly. That's what happened with sweet woodruff. I started experiencing dieback on patches of this plant in both winter and summer. I suspect it's a bit difficult to grow in the hot and humid Southeast and especially the Deep South. At the same time, when I started to try to dig up patches, I found a disturbingly elaborate web of roots that seemed to occupy the entire top layer of soil. I could literally lift the plant and the soil would come with it like a piece of carpet. So I ended up evicting sweet woodruff entirely from my garden. Fortunately, unlike Ajuga or Geranium sanguineum at least it had the decency to leave politely and not try to make too many repeated comebacks. I've since shifted my gardening more toward natives, especially vis-a-vis spreading groundcovers. If you do grow this plant in the U.S., please check to make sure it's not invasive in your region, as might be the case particularly in the Pacific Northwest, Upper Midwest and parts of New York State. - Beautiful light-green foliage with an interesting whorled shape. That foliage stays clean and green throughout much of the year. As far as I can tell, Sweet Woodruff is not bothered by any insects or diseases. - Spreads moderately quickly but mainly grows in spurts (autumn and spring, I believe). The patches I've got seem to reach their spring size and then stay that way. The fact that it's not constantly expanding its territory makes me think I could control it fairly easily if I needed to. Or not. See update above. Sweet Woodruff seems to thrive best in shady spots. This one is sheltered under the canopy of a crape myrtle. - Tough! Grown in partial shade, it survived last year's 100+ temperatures and brutal drought. Temperatures down into the teens and 20s this winter didn't faze it one bit. (It is hardy to zone 4.) Or not. Ended up getting burned by even lower temps without snow cover in subsequent winters. Started melting out in our summers too. - Flowers a little bit in springtime. Well, my plants didn't flower at all their first year. They flowered a little this year. I've seen photos online with lots of (small) white flowers, so perhaps they'll have more flowers in future years. - Some sources say that Sweet Woodruff can repel mosquitoes and that the dried leaves can repel moths. - I believe the flowers were formerly used to flavor spring wine in Germany, but nowadays internal use is discouraged due to the fact that the plant contains a compound called coumarin that reportedly can damage the liver. 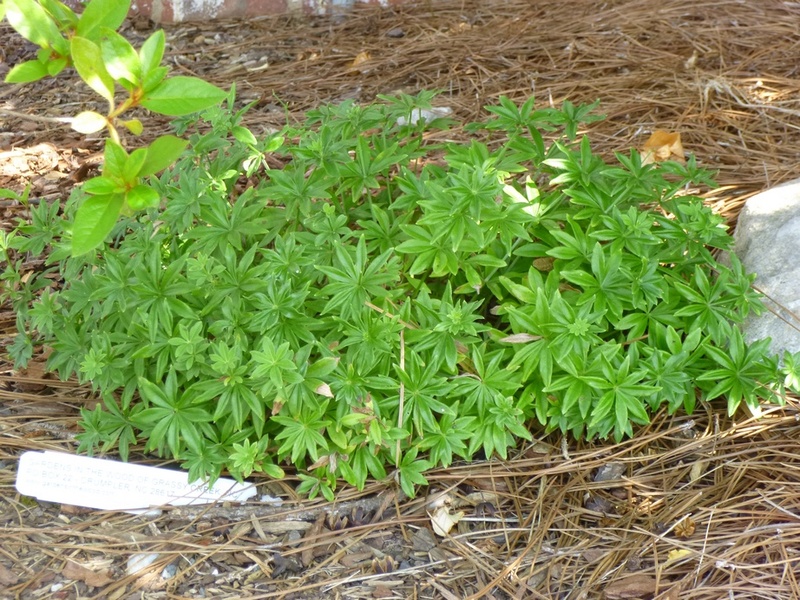 - Not native to the Southeastern U.S. Sweet Woodruff comes originally from Europe. I was worried that Sweet Woodruff would overrun Rozanne Geranium, but the geranium actually seems to have the upper hand. The kicker will be to see what happens next year. Because the semi-evergreen Sweet Woodruff will most likely expand in all directions in early spring before the geranium breaks dormancy. 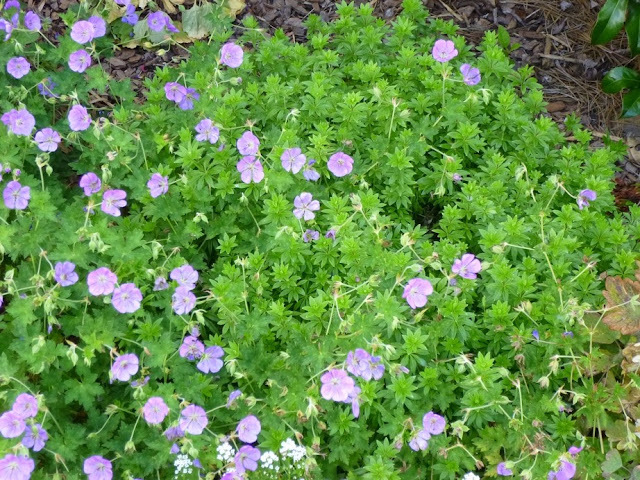 Which means the geranium may try to emerge right in the middle of the Sweet Woodruff next year. It will be interesting to see what happens as these two duke it out. Regardless, it looks lovely right now with geranium foliage and flowers intermingled with the Sweet Woodruff. - Sweet Woodruff doesn't necessarily play nice with other small plants. I would say that thick lush growth that blocks weeds would almost certainly stop the germination of any annuals and could very well overwhelm smaller perennials. For instance, my largest patch of Sweet Woodruff is butting up against a hardy geranium (Rozanne) and has practically swamped some Smilacina racemosa (False Solomon's Seal). On the other hand, I can't see Sweet Woodruff causing any problems for shrubs, trees or any perennials that grow taller than say 6 inches. Cornell calls it aggressive, but not invasive and says other plants can come up through its foliage. - Depending on your aesthetic standards, there's a point in late winter / early spring when you might not be too happy with the way Sweet Woodruff looks. The previous year's foliage does look good throughout January (at least here in zone 6/7), but there's a point in February or March when the evergreen / semi-evergreen foliage turns brown and crispy. Lots of websites will tell you to cut the old foliage near the ground in Spring to stimulate regrowth. 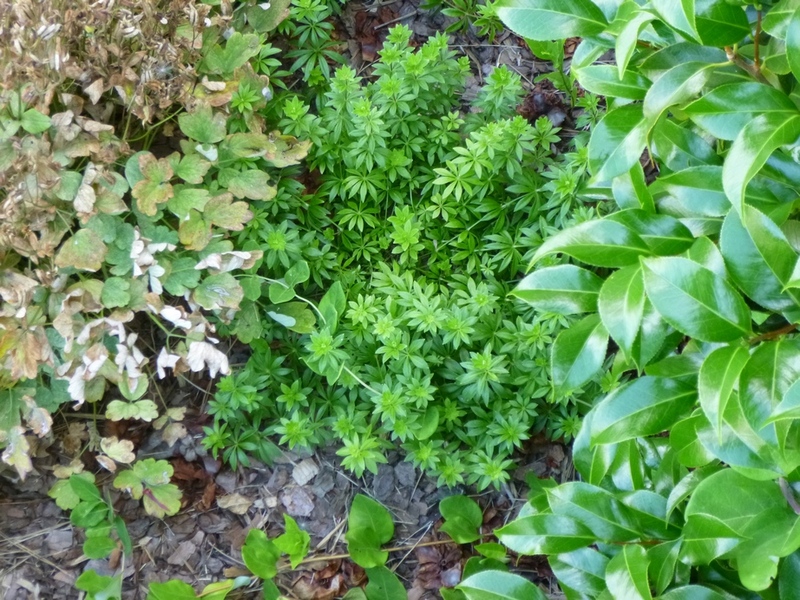 Being an experimental sort of gardener - and figuring that Sweet Woodruff had evolved and probably thrived in the wild without anyone coming along to trim it back in the spring - I decided to leave it alone to see what would happen. After a few somewhat messy-looking weeks, fresh new green growth quickly obscured the tattered foliage of the previous year. And I'd guess that old foliage both protects the new foliage while it's emerging and then later feeds the plant as it decomposes back into the soil. So if you're not a perfectionist, I'd suggest going for the low-maintenance approach and forgoing the spring trim. If you prefer to keep your garden looking pretty all the time in case a photographer from House Beautiful drops by, I don't think there's anything wrong with trimming or probably even mowing the old foliage back to the ground in the spring. Sweet Woodruff is one of my favorite groundcovers. I'm planning on dividing and spreading this to several other semi-shady parts of my garden this autumn. I might even try putting a piece in full sun, just to see what happens, though I doubt sincerely that Sweet Woodruff would be happy in full Southern sunshine. Ultimately shovel-pruned. Do not recommend.